The seizure of £75,000 worth of oxycodone is part of a "growing culture of the misuse of prescription drugs", according to a drugs councillor. The drugs were recovered by police in south Belfast and Comber, County Down. The opiate painkiller, sometimes nick-named "hillbilly heroin", has effects, addiction, and chemical composition extremely similar to heroin. Jim Weir, from Forum Against Substance Abuse, said prescription drugs were abused by young and old people in NI. "It's a prescription-only drug used to treat severe pain," he said. "It can be a useful and positive drug if used under medical supervision, but unfortunately that's not what we're seeing." A 31-year-old Belfast man was arrested over the find on Friday. He was questioned over illegal importing activity. Mr Weir said there was a demand for this type of drug in Northern Ireland. "It is an opiate-based, semi-synthetic drug so the effects are similar to heroin and can cause addiction," he said. "It's an incredibly addictive drug and for that reason people will access it in any way they can. "There is a large black market as well, people who are prescribed this drug are then selling it on to make a profit." 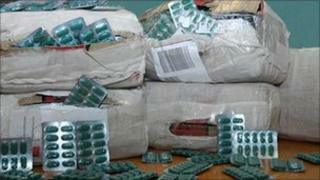 Health Minister Edwin Poots said he was not aware that the drug had been seized in Northern Ireland before. "They've been imported from the Indian sub-continent and ultimately the suspicion will be that these are not going to be used for medicinal purposes," he said. Mr Poots said he had been made aware that there was "a lot of difficulty" getting good quality heroin in Northern Ireland at the moment. "So people are engaging more and more in these type of activities, and this is called hillbilly heroin or poor man's heroin and ultimately we need to deal with this particular challenge as well as dealing with the heroin challenge," he said. While oxycodone can be safely used under prescription, its misuse has been linked to hundreds of deaths in America. It became known in the US as 'hillbilly heroin' or 'poor man's heroin' because of its abuse in rural areas. Oxycodone is a synthetic form of morphine, but is twice as strong, and is often prescribed to cancer sufferers. In the UK it is classified as a Class A drug under the Misuse of Drugs act.